Jongchui Choi helped South Korea steal the show at the 2015 IPC Wheelchair Dance Sport New Taipei City Cup Open which wrapped up on Sunday (12 July), winning two of his country’s four gold medals. Choi impressed the judges in the men’s single class 1 and 2, and then paired with Chaeyoung Son in the combi freestyle class to capture gold in both events. In total, South Korea collected 10 medals at the competition which featured seven events. It was a refreshing performance from Choi, who showed he is still in good form after winning the duo standard and duo Latin (both class 2) at the Incheon 2014 Asian Para Games. We had two succesful competition days here! I think you all are waiting for the results of the second day. And to all the funs of the IPC Wheelchair Dance Sport! Georgia and Kyrgyz Republic did a very good debut at IPC WDS competition! 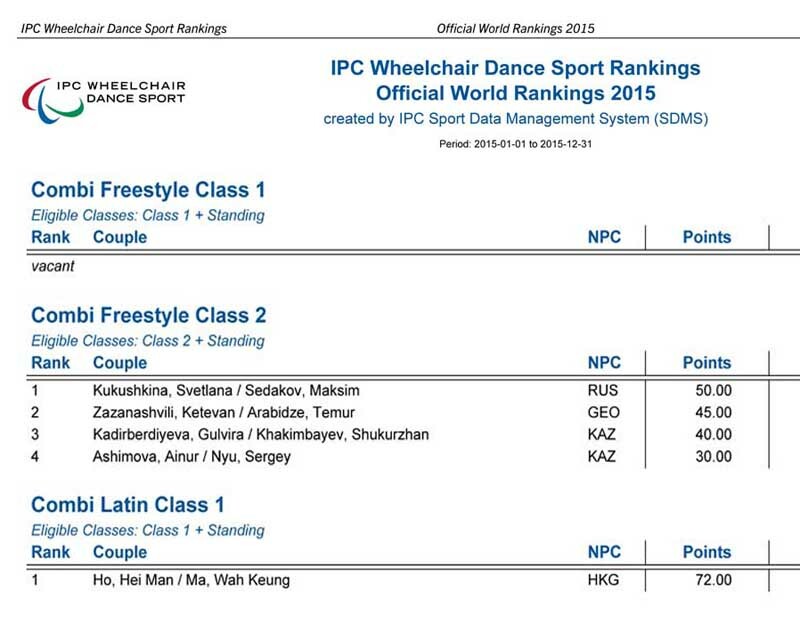 The first day of the 2015 IPC WDS Kazakhstan Open competition is over! It was held with a great success. Tomorrow will be another day!